Bracelet winner & RunGood Ambassador @GrantHinkle ships the @RGPokerSeries Downstream Main Event for $28K. RunGood's trip to Downstream Casino Resort in Quapaw, Oklahoma was another party on the felt with plenty of familiar and new faces among the crowd. The action wrapped up with RG Ambassador Grant Hinkle taking home the Main Event trophy and the $28,260 top prize. The Overland Park, Kansas, native triumphed over a field of 199 entrants to take home first place after leveraging his chip lead to whittle down his heads-up opponent and then flop a set of threes against his opponent's pocket fours. 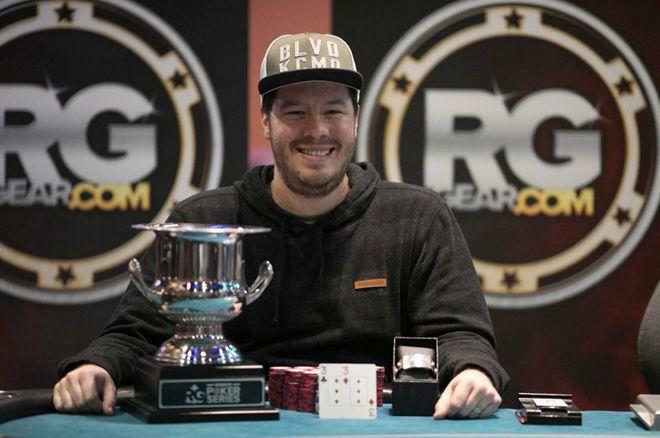 A WSOP bracelet holder, the RunGood Ambassador joined the team in 2016, having a solid resume with $1,614,499 in lifetime tournament winnings. Still, Hinkle remains employed outside his poker career as a Governance Risk and Compliance Consultant. He'll return to work Monday morning as though a Main Event win is just a matter of course. Hinkle built his stack all at once toward the end of Day 1 after nursing his starting stack for the first nine levels. He came into Day 2 second in chips with a stack of 221,000, right behind the Day 1 chip leader and eventual second-place finisher Jesse Jones. JD Hays, Matt Ellis and Li Wu all fell to the sword of Hinkle at the final table. In the final hand with Jones, Hinkle held a commanding lead with over 3 million chips to Jones' 600,000. With the blinds at 20,000/40,000, Jones limped on the button and Hinkle moved all in from the big blind. Jones immediately called for his remaining 560,000 chips. Hinkle tabled while Jones held . Jones even had Hinkle's suits covered. But drawing slim is not the same as drawing dead, as evidenced by the flop. Hinkle's set would hold through the turn and river to take it down. Here's a look at the series winners from RGPS Downstream as the series prepares for its next stop in Kansas City on May 1.